Oliver Jarvis is set for a return to Japan, having been announced this week as a driver for Toyota’s Super GT program in the new-look GT500 class. The 30-year-old Audi factory driver will dovetail his expected partial-season LMP1 program with a full-time drive in a Lexus RC F that will compete in the new-look GT500 class. Super GT sees a transformation for 2014, with the adoption of DTM technical regulations for its top class, although featuring two-liter four-cylinder turbos instead of the four-liter V8s currently seen in the German championship. Jarvis, who finished third in the Japanese F3 championship in 2007, will be joined by Hiroaki Ishiura in the No. 39 entry, fielded by Lexus Team SARD. 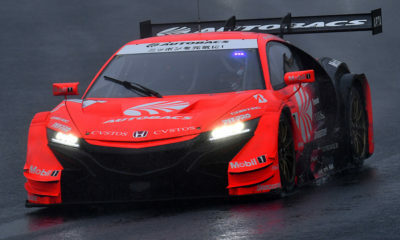 “I am delighted that Toyota and Team SARD have given me the opportunity to race in SUPER GT this year,” Jarvis said. “Ever since racing in Japan in 2007 it has been my intention to return and race in what I consider to be one of the best championships in the world. “With the introduction of the new cars it felt like a perfect time to come back and I am extremely grateful to Team SARD for putting their faith in me. Despite being an Audi-contracted driver, Jarvis’ LMP1 teammates Andre Lotterer and Loic Duval have also been able to previously compete in Super GT for the Japanese manufacturer. Jarvis’ program in the new Audi R18 e-tron quattro has yet to be defined, but it’s expected the Englishman will again contest the Six Hours of Spa and 24 Hours of Le Mans in the third diesel-powered entry. The Super GT season kicks off in Okayama on April 6.